The main difference in appearance between the black racer and black rat snake lies in the glossiness of the snake's skin. 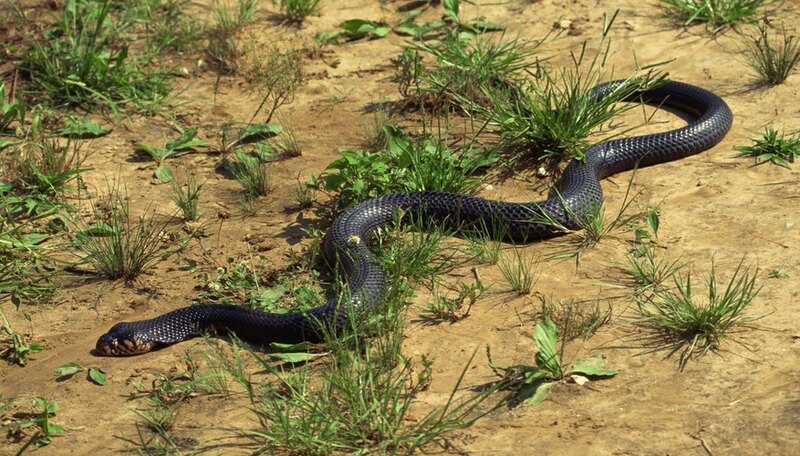 Black racer snakes out glosses its duller cousin, the black rat snake, whose skin offers up a dull, ridged appearance. As slender and graceful snakes they both grow to around the same length -- about 4 feet -- though some may grow as long as 6 to 8 feet. Both snakes climb and can be found in trees and bushes. With ridged or keeled scales, members of the rat snake family may have blotches, stripes or a combination of both. Some rat snakes may be uni-colored, lack black pigment altogether or be white colored and blue-eyed. In comparison, the black racer is completely black, both above and below with smooth, glossy scales. Male racers can be distinguished from the females because their tail is longer with a wide base and even a bulge, while the female’s tail tapers from her body. 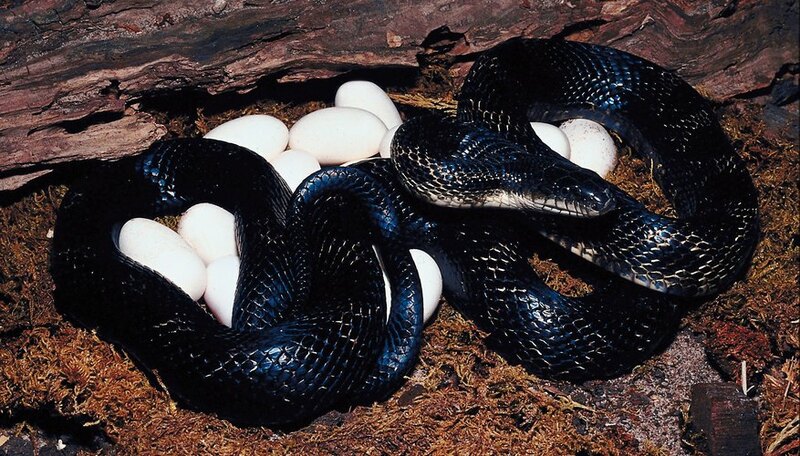 The black rat snake mates in May and lays a dozen or more eggs in July, often in a pile of manure, so the heat from the manure helps incubate the eggs. The young hatch in September at about 1-foot long. 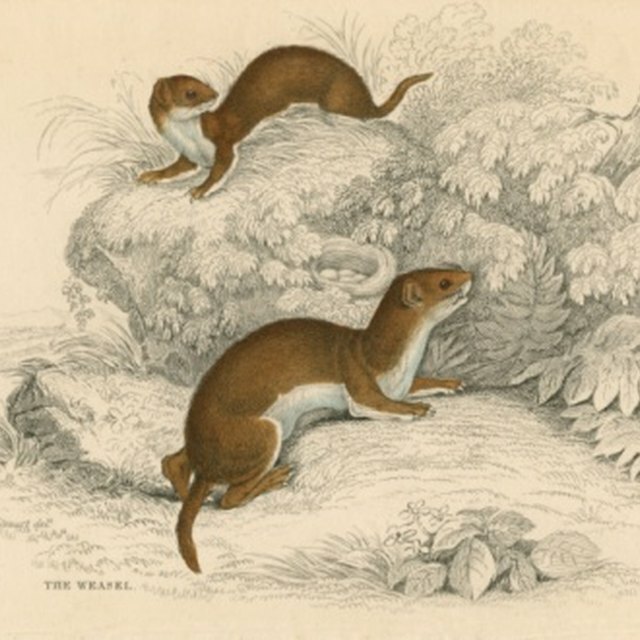 The racer mates from late April until early June, and in June or early July, the female lays three to 32 oval white eggs in a hidden nest, a rotted stump or log, old mammal burrow, or nest cavity. The babies hatch around August or early September and are from 7 1/2 to 14 inches long. Racers sometimes share communal nests. Rat snakes get their name because of their diet: rats and other small rodents, which makes them beneficial to have around to help control infestation and the diseases carried by rodents. When young, it eats small lizards, baby mice and small frogs. The rat snake kills its prey by constriction. It grabs the prey and wraps its body around it and squeezes until the prey suffocates. The racer eats small animals, insects, birds, frogs, lizards and other snakes. Even though its Latin name is coluber constrictor, the racer doesn’t constrict its prey, but pins it with its coils or just swallows it alive. Racers speed after their prey. Ferocious when cornered, black racers vibrate the tips of their tails among dry leaves so that they sound like a rattlesnake. If they're grabbed by the neck they will thrash around wildly, and if they bite they’ll jerk their head to the side and rip a person's flesh or defecate. Black rat snakes tend to be less aggressive in their defense. When approached they’ll freeze. Some might vibrate their tails like the rat snake and then strike when all else fails. Some rat snakes are kept as pets, while racers almost never are. 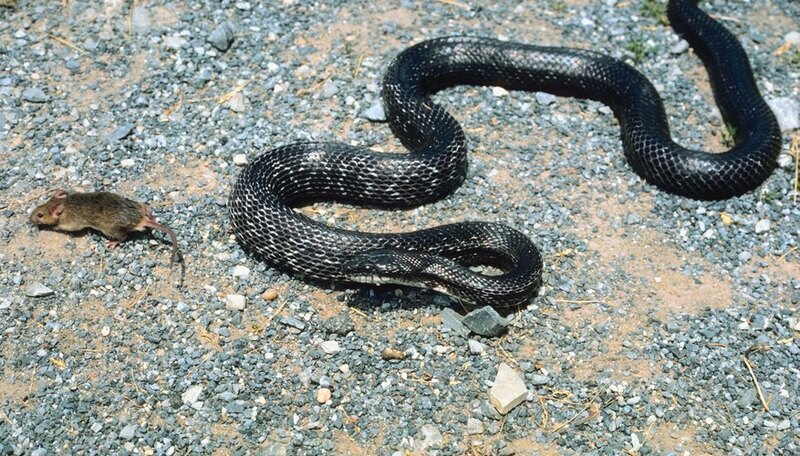 The black rat snake is found in the United States from New England throughout the south, the Midwest and into Texas, with populations in southern Canada. They like rocky hillsides and flat farmland. 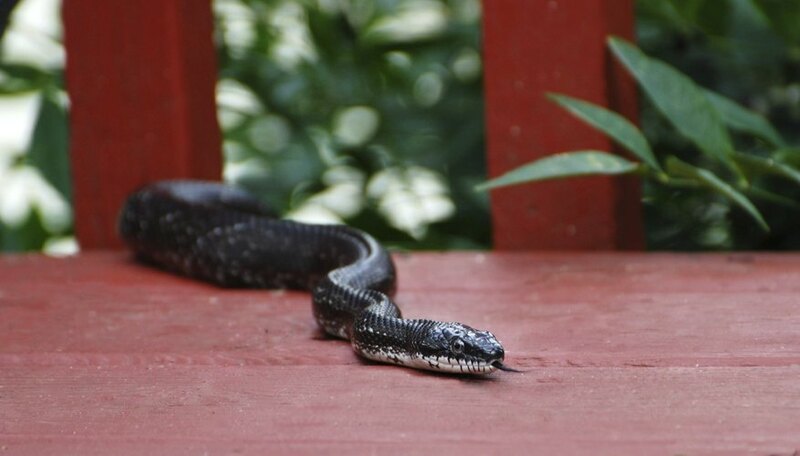 Racers have a larger range, though the black racer also can be found in the eastern part of the United States, from Maine to Louisiana. McKanic, Arlene. "The Difference Between a Black Snake & a Racer." Sciencing, https://sciencing.com/difference-between-black-snake-racer-8427641.html. 19 April 2018.